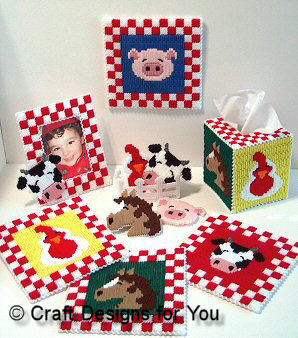 Bright and Cheery Farm Animal accessories to make in quick and easy Long Stitches! Full instructions for a boutique tissue box cover, matching coaster set, frame (holds 4x6" photo) and wall-hangings that can also be used as trivets! Colorful Hen, Horse, Cow and Pig adorn these cute accessories. Stitched with 4-ply yarn on 7-count plastic canvas.